Geospatial Media & Communications presents the 2nd edition of the comprehensive report which is a collective, harmonized and in-depth analysis of the geospatial industry covering technologies, infrastructure, policies, drivers, users, challenges, trends and innovations. The global geospatial market size stands at nearly US$ 300 billion, and is likely to touch 440 billion by 2020. 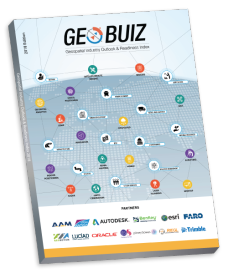 GeoBuiz - 2018 presents the geospatial industry market report and comparative assessment of 50 countries for their geospatial readiness to the global audience from industry, government, academia, development sector and other stakeholders at large. 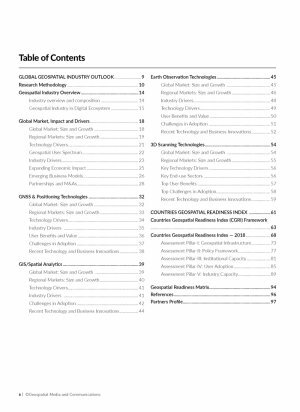 The geospatial industry market report captures the global size, growth and value impact of the global geospatial industry till year 2020, along with key insights on technology drivers, business models, top user sectors, user benefits, major adoption challenges etc., as a whole, and for its four major technology segments which are GNSS and Positioning Technologies, GIS/Spatial Analytics Technologies, Earth Observation Technologies and 3D Scanning Technologies respectively. 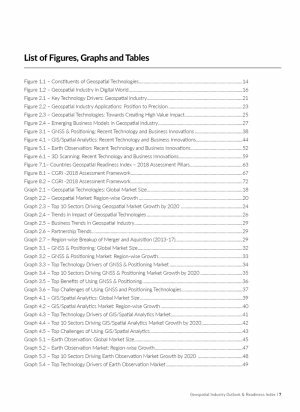 The report brings forth a collective and harmonised view on the geospatial industry’s global market size and value impact, its distribution across markets, geographies and industry segments on the 2013-2020 timeline. The data and estimates captured are from multiple markets and impact studies, which have been published in recent times catering to specific segments and aspects of the geospatial industry at national, regional and global levels. To provide an integrated view which can be used with ease and referred to objectively, multivariate data analysis techniques has been used to draw intelligence and inferences in a meaningful way. The analysis from these multiple reports brings to light historical growth rate of the industry at 11.5 % (year 2013-2017), with a projected growth rate of 13.6 % up to 2020 (year 2018-2020). Globally, the geospatial industry market is witnessing unprecedented growth in all geographies with high double-digit growth in the Asia Pacific, Middle East, Africa and South African regions, riding on demand from emerging market geographies. 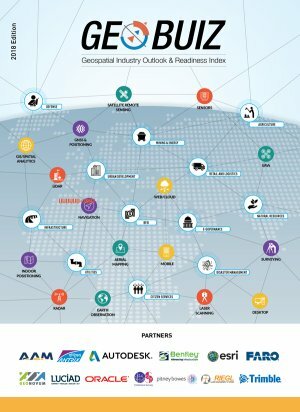 However, overall engine of geospatial industry growth as well as its readiness (Countries Geospatial Readiness Index -18) to meet current and future leadership remains with North America. This region will continue to maintain its market dominance riding on proactive initiatives to enhance commercialisation within the industry segments, (especially in the EO upstream value chain), and innovation led economic development model. At the same time, the growth in Asia Pacific economies is something to watch out for in comparison to European markets (in relative percentages). While the former has demographics and demand drivers favouring long-term higher growth rate to surpass European markets comfortably in the 2020-2025 scenario, the latter will remain a significant market and solutions provider at a global scale. 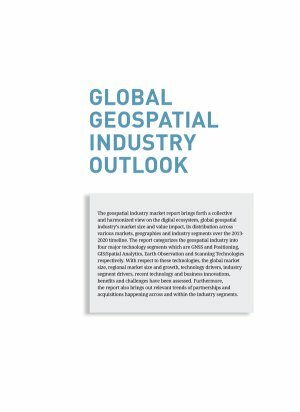 The key industry trends and drivers for the geospatial industry and its various segments have been captured from multiple focus group discussions, electronic surveys and interviews with industry leaders across industry segments, users, system integrators, solution providers in Geospatial, IT and Engineering domains. 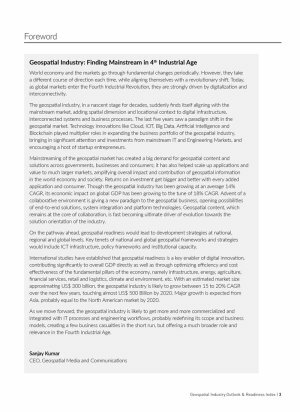 Together with the market size and growth analysis; key industry trends present a wholesome perspective on geospatial industry and its value proposition to the global audience. The second part of the report, i.e., Countries Geospatial Readiness Index (CGRI)-2018 presents the assessment of select 50 countries for their geospatial readiness, (current as well as future). The appraisal framework uses five assessment pillars: (i) Geospatial data infrastructure; (ii) Geospatial and enabling policy facilitation; (iii) Geospatial domain education and research institution capacity; (iv) User adoption levels at organization levels; and, (v) Geospatial industry capacity, i.e., industry strengths, representation and venture creation support eco-systems. The comprehensive framework has evolved on the first assessment exercise last year, i.e., CGRI-2017. Data collection, analysis and an assessment framework with relative weightages has been made more comprehensive and refined for accuracy in capturing the comparative strengths and weaknesses at the national level. The purpose and approach of CGRI-18 is to enable decision makers (both public and industry stakeholders) with actionable insights to (a) develop an integrated approach on advancing geospatial technology eco-systems crucial to maintaining competitive advantages globally and; (b) deliver better geo-enabled services to citizen-consumers. 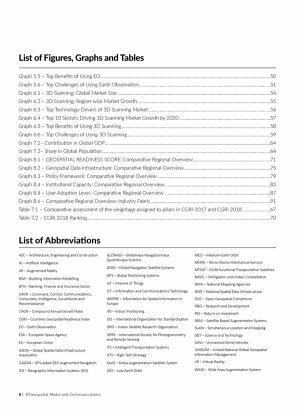 CGRI-18 is not a ranking exercise but a tool to assist the development of a holistic outlook for framing a national geospatial strategy in tandem with advancing digital technologies. To help easy understanding, countries have been grouped as ‘Leaders’, ‘Challengers’ and Aspirers’ in each of the evaluation index pillars with comparative insights, highlights accompanied with market geography- wise infographics. On CGRI-18, the United States of America (USA) stands on top as the most geospatial ready country in the world leading in all five pillars of the evaluation framework. 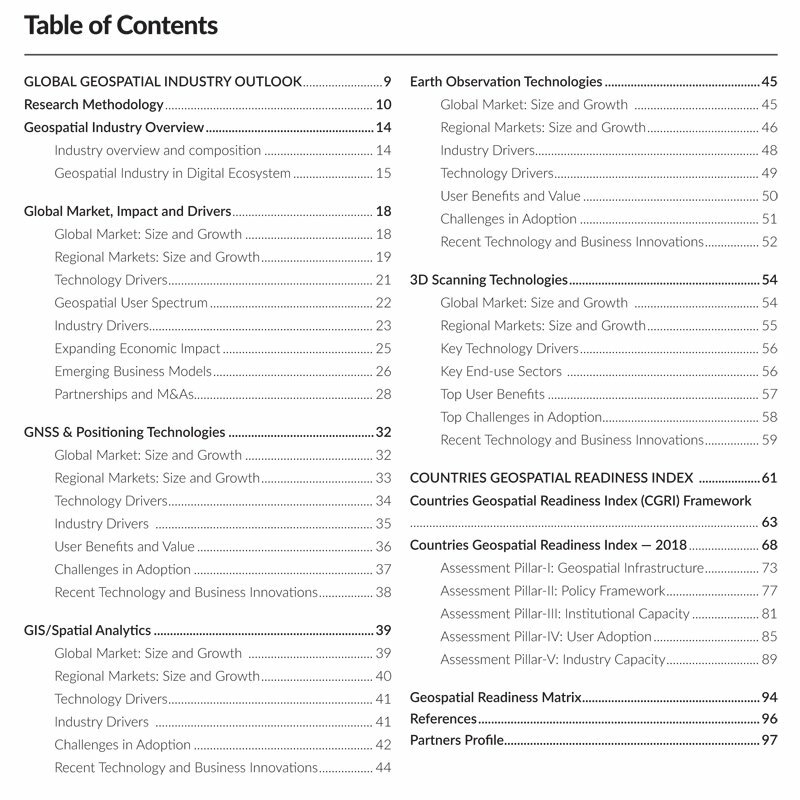 While developed economies in general lead on geospatial readiness, it is the group of emerging economies under ‘Challengers’ which hold the promise for ‘future market growth’ commensurate with the extent to which geospatial industry solutions will be strategically deployed to address the socio-economic development challenges in these countries. Geospatial being the only technology capable of establishing interactions and inter-linkages between Bio-Physical, (i.e., geography and natural resources), and social elements ( human civilization), over time and space, holds the key to efficient delivery of socio-economic benefits, taking governance to the last man across national economies. The effective use of its transformational potential rests on a proactive and integrated approach at individual nation levels.